To help Google’s Crawler to find and index your pages after publishing or certain changes, it may be important for you to create a sitemap of your WordPress website. This sitemap must then be submitted to the search engines. With our WordPress Plugin BAVOKO SEO Tools you can generate a complete sitemap of your WordPress page without effort and submit it directly to Google. In addition, BAVOKO SEO Tools will automatically update your sitemap with every change on your pages and ping it to Google once an hour. 1 What is an XML Sitemap? 3 Why is a Sitemap so important? A sitemap of your WordPress website is a complete list of all URLs on your page – comparable to a map. The WordPress sitemap shows search engines, which pages exist and where they can find them on the next crawl to index them. It is particularly important that the data in the sitemap is as up-to-date as possible. For this reason BAVOKO SEO Tools updates your WordPress Sitemap after every change and automatically notifies Google every hour. With BAVOKO SEO Tools you can create a complete sitemap of your WordPress website within a few minutes. 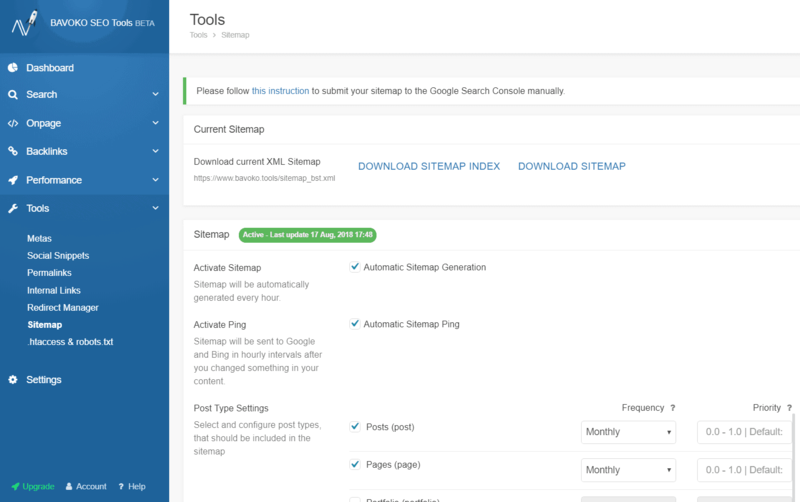 Click on “Sitemaps” in the Tools section to begin the setup. Check the box “Activate Sitemaps” and additionally select which post types of your WordPress website should be considered for the creation of the sitemap. For each type of post to be included in the sitemap, you can now set its priority and frequency. Save your changes by clicking on “Update Sitemap Settings”. BAVOKO SEO Tools will then automatically generate your sitemap. Why is a Sitemap so important? Since a sitemap of your WordPress page serves primarily to help the crawlers of the major search engines to find and index your pages, it is also an important tool that you can use for effective search engine optimization of your website. This is particularly useful if, for example, you have a particularly large number of pages or if these pages are poorly linked to each other. In order to appear faster in Google’s organic search, creating and submitting a sitemap can then be advantageous. Once your WordPress sitemap is created, you can submit it directly to Google by placing the sitemap in the Google Search Console. BAVOKO SEO Tools will then automatically update the sitemap as soon as you make changes to your site. To help Google index your pages, it is almost always rewarding to create and submit a complete sitemap of your WordPress website. With BAVOKO SEO Tools the creation of your WordPress Sitemap as well as its transmission to Google works with only a few clicks and without effort.